Isaac Asimov is widely regarded as one of the fathers of science fiction, and as one of the better writers in recent history. He was also one of the most prolific authors ever. He wrote hundreds upon hundreds of short stories, dozens of novels… I could go on. A lot, basically. One of his most recognized accomplishments was without a doubt the Foundation series. If you haven’t read that, then A, what have you been doing all your life, and B, go read it now. Seriously. Right now. 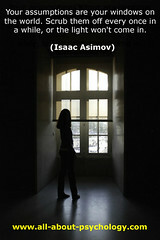 Besides being a generally brilliant author and fount of creativity, Asimov also had a useful tool which he used often. Inspiration by free association. He once said that he would open a book in two or three places, choose a few words at random, and build a plot based on those words. There’s method to Asimov’s madness. Being stuck usually means that you have absolutely no idea where to start, but the actual starting point is not necessarily important in itself. So free association can often get you kick-started in a direction you would never have thought of. Next time you want to write something but haven’t the faintest clue where to begin, try Asimov’s trick. Open a book and choose some words. Inspiration by free association. It even rhymes – what more can you ask for?